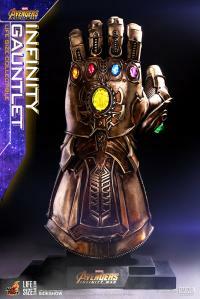 Since the debut announcement of Marvel Studio’s blockbuster, Avengers: Infinity War, fans were instantly thrilled and captivated by the mysterious Infinity Gauntlet, as one who possesses the Infinity Gauntlet shall gain omnipotent power. 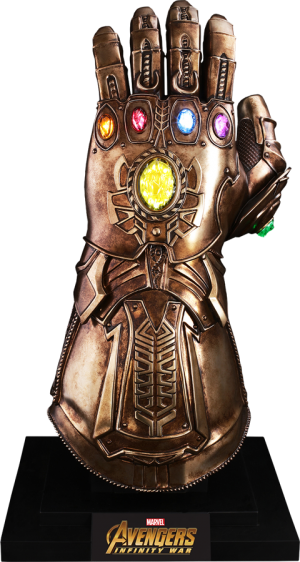 Thanos, the newly introduced supervillain, is now in search for the crucial Infinity Stones which include the Mind Stone, Time Stone, Power Stone, Space Stone, Reality Stone and Soul Stone to complete the Infinity Gauntlet. Oversized Item: The shipping cost will be calculated on dimensional weight rather than product weight for this item due to its oversized dimensions. (c) 2018 MARVEL . 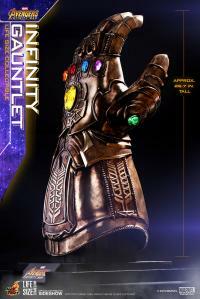 (c) 2018 Hot Toys Limited. All Rights Reserved. Pay as little as $279.00/mo. 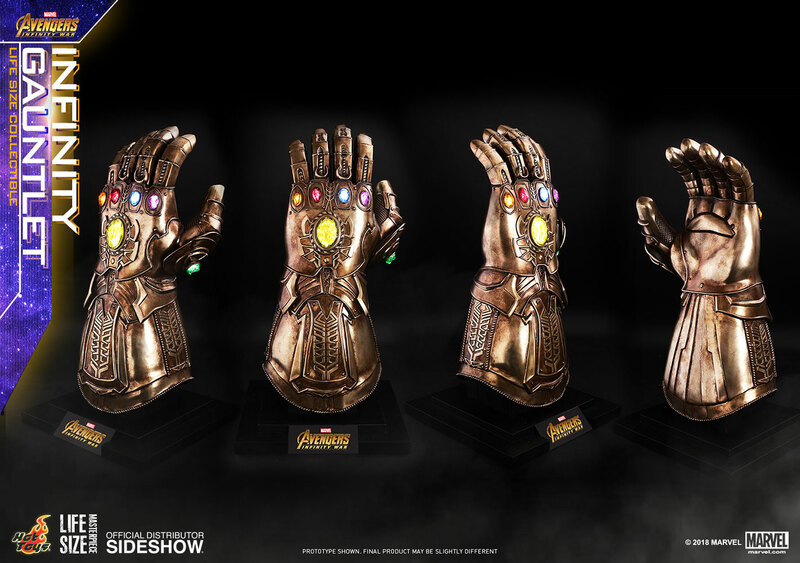 Hands down (pun intended)...one of the premiere pieces in my collection. Very well constructed; love the paint job. Stones move slightly when touched which gives it a nice feel as if you could remove them, but they aren’t going anywhere. Very well made and makes its own statement when you enter my collectible room. 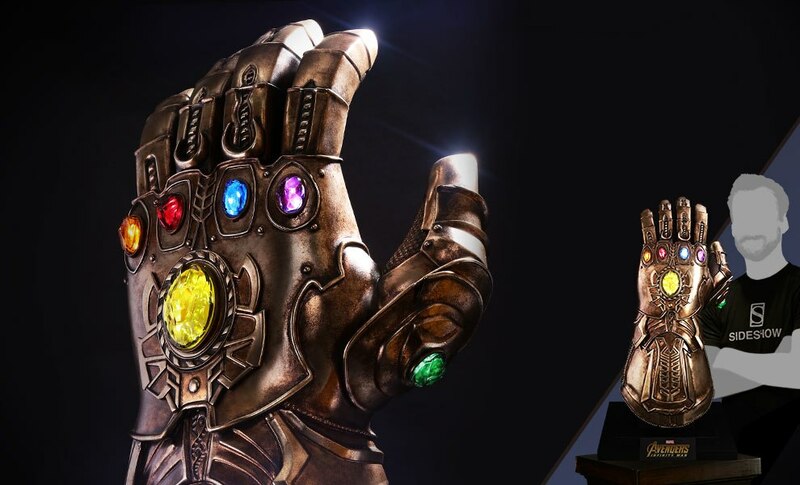 Looks great next to my Thanos on the Throne. Now all we need is a 1:1 bust. Great job on this! This thing is damn near perfect. My only gripes are all extremely minor. 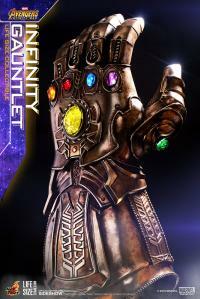 First, the USB cable that comes with the gauntlet is ridiculously short. Its only about a foot long. Unless you display this thing right in front of an outlet, you gotta buy a USB extension. It also doesnt come with an AC power adapter so you may have to buy one of those. I would make sure if you already have one, make sure it doesnt exceed the power output maximums listed on the instructions. 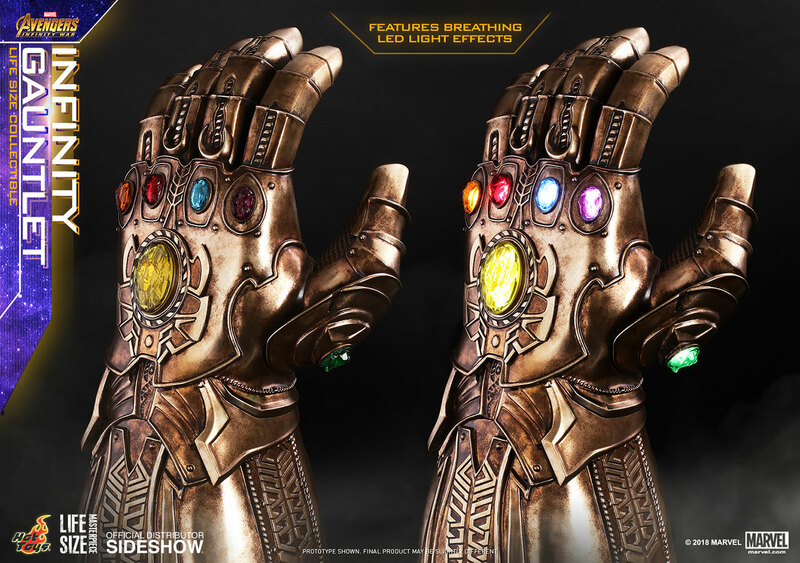 My only other “complaint” is that if you are looking directly at the gauntlet, you can kind of tell that the mind stone has six distinct little LEDs in there as opposed to looking organically illuminated like an actual infinity stone would. In no way is this a major detriment to how this thing looks, but it is something I noticed. If you look at it from an angle it looks absolutely perfect. 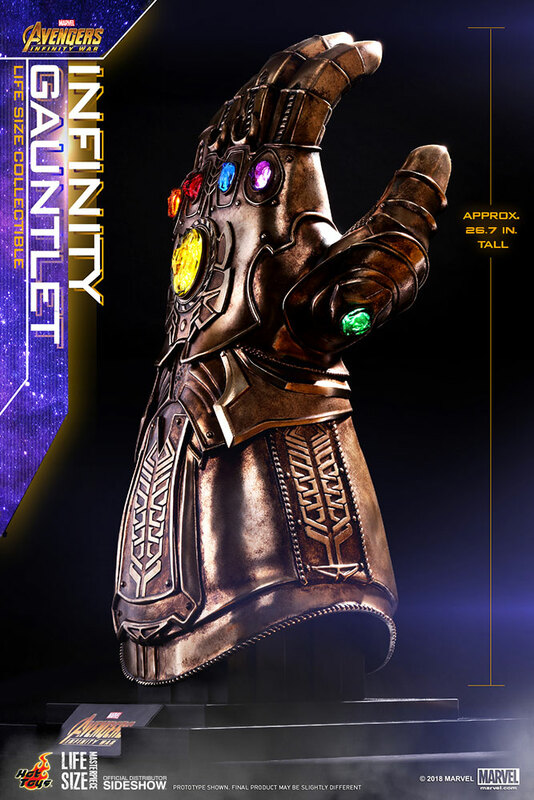 I would recommend displaying it at an angle anyway because it allows for a better view of the time stone on the thumb. Sorry for the wordy review, but overall this thing is amazing. The sculpt, the paintjob, and the light effects are all top notch. If you can spare the cash, pull the trigger on this one. This thing is massive, weighs over 40 pounds, and looks sensational, lit up or not. It will undoubtably be the centerpiece of any collection. BUT... I'd give it 4 stars out of 5. To plug it into your wall, you need to buy a USB charger, and most likely a USB extension cable, as the two cables that come in the box are only about a foot long. On the whole, I'm really impressed, but I feel like they cheaped out at the last minute with short USB cables and nothing to plug into an outlet. Still, if that doesn't bother you, definitely check this out! No words of how beautiful this thing is. The downside of this is just the colors are feel like little darker, the box that it came isnt keep-able meaning like it has no art box, it shipped with just a regular box with words of Infinity Gauntlet and had to buy an AC USB. But all in all, I love it. I bought this ginormous replica and my gosh its amazing! cant see anyone making a better one, this will be the center piece of any collection as its definitely the center piece of mine. Simply put, this is an amazing piece. 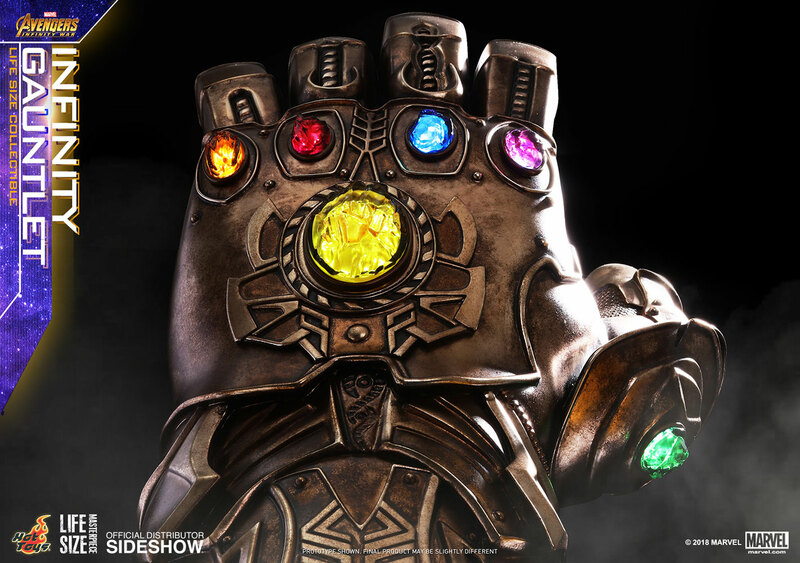 A must have for any MCU or Marvel fans.